Included as part of the instruction I give to my students, whether at college or in my own studio, is an insight into the commercial world of carving. It is my hope that a quick sortie into the procedures that I adopt on a commission will explain some of the problems encountered by this type of work. 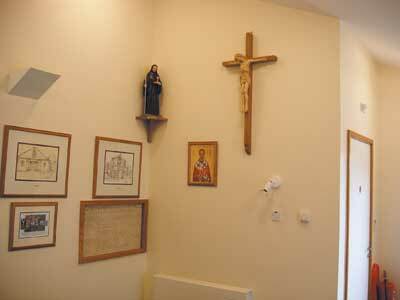 The commission was a crucifix for the Roman Catholic church of St. Nicolas at Boldmere in Sutton Coldfield, Birmingham. 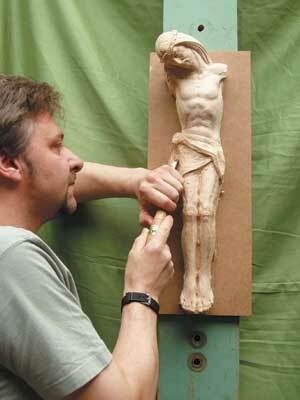 The crucifix is a small 22-inch copy of a 4-foot figure in lime that I had already carved for the same church. For this article, I am going to assume that all the research has been done including the anatomy, you have prepared all the drawings and successfully undertaken the production of a maquette. You will have already quantified and obtained the timber - laminating it if appropriate - and the side profiles cut - possibly the front, but definitely not the back - then you are ready to proceed with the carving. 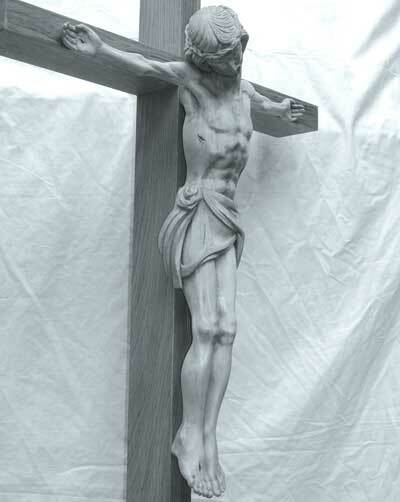 With a crucifix, the arms are separate - this is traditional and practical because of the grain direction, and it is usual that an extra piece of timber is laminated onto the front of the block at the top for the projection of the head. 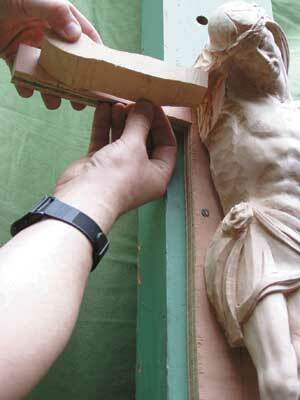 Position the work by screwing it on a 'Carvers Post' - also a traditional piece of equipment - and for my commission, I fixed it above head height as the crucifix will finally be seen high up on the altar table. This high working height enables me to simulate its final position from which it is going to be viewed; it would be silly to carve something flat on a bench if it is to be seen upright. 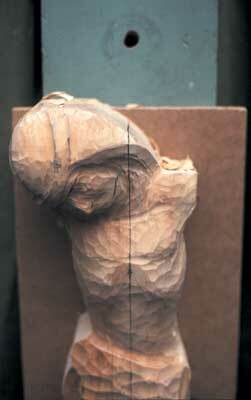 During the execution of the figure, all you need to access the work is a box to stand on. I always, always work initially from one viewpoint, usually the front. Never cut behind this viewpoint until you are completely sure the features facing you are correct. This is a procedure that I constantly employ and have stated and explained in previous articles that I have written. Centuries of figure carvings have been executed in this way, allowing errors to be corrected by moving the features back within the block when the 'happy accidents' are made, so reducing labour and material costs. Working the back too prematurely destroys any chance to create the correct form from the front and should be avoided; the great Michelangelo followed these very practical rules. This procedure involves considerable patience. We all wish to carve around the work but believe me, it reaps dividends later on when having to re-adjust those errors. The most practical advice I can give when executing figure work is to always work from a 'centre line' that is drawn onto the work with a straightedge, and at every stage during its execution will have to be continually redrawn - extracting the material obviously removes the line. 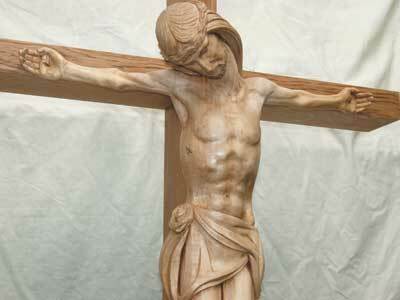 Otherwise have a 'plum line' hanging in front of your work which can be eyed through onto the figure as a centre line. This also helps to ascertain that the work is constantly vertical. 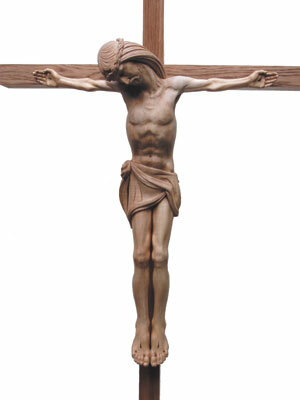 With the design of this crucifix, the body is fairly easy because it is symmetrical through the centre line, the exception being the head. 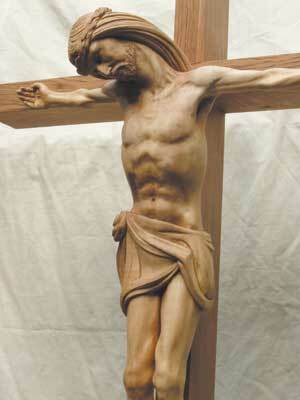 Remember in this design as with most crucifixes, the figure's heels and posterior have to touch the background, which of course will be the cross. This applies to the hands but these are separate and will be worked later. In this situation these features have to be considered and found first, allowing you to then connect and position the rest of the body. 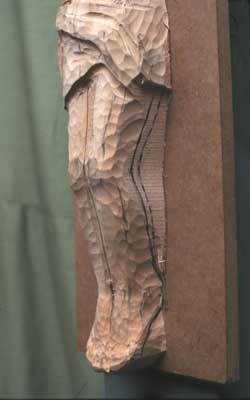 Positioning these features can be achieved by the use of a maquette or drawings that you will have initially produced prior to the execution of your carving. I have only used two chisels to do all the roughing out on the body - these are 3711-13mm BN and 3705-20mm BN, both manufactured by Henry Taylor, the BN identifying a 'bull nose' cutting edge. You should observe that I have not worked behind the figure and have ignored any detailed work. Having positioned and 'sketched in' or 'roughed in' the body, the most demanding part of the work has to be undertaken, which is the head and face. The reason for this is if a drastic mistake is going to be made, it will be most noticeable on the face and in particular, the eyes. The eyes are most critical when carving a face because when communicating with people, we all make eye contact, and the same applies when viewing a statue. They are usually the first visual contact to be made with the figure and have to be correct, so getting the head and face correctly positioned is essential before the eyes can be carved. Many part-time carvers seem to leave the most difficult parts of a job until the end, putting off the problem, so if a mistake is then made, the work is ruined. Far better to do it sooner than later as this allows it to be rectified. At this point, a commercial break is called for to tell you of an excellent DVD and video that will help you solve these problems when carving a human head. For many years, the two questions that are constantly asked of me - apart from sharpening chisels - is how do you carve eyes and hair? 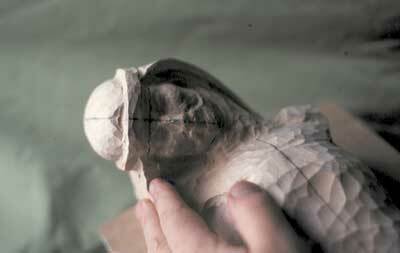 In my DVD, Carving the Human Head, I have given very simple and achievable techniques for carving a head, in which I constantly include projects that are set throughout the video. I then implement these techniques onto a portrait bust of a very handsome individual! The DVD also introduces you to the bull nosed chisels and their practical application within carving the head, but also their invaluable use with letter carving. These types of chisels are found only in the range of Henry Taylor Tools Ltd.
Now back to the important bit. Of course the body has to be sketched in before the position of the head can be realised and worked. The neck between the head and torso may incorporate any adjustments to be made. In this design, because of the abstract and unrealistic curve to the neck, this means that the head turns down further than humanly possible. It is appropriate and practical therefore, for the head to have its own centre line that is placed on its front and is continued over the crown of the head. Aligning my eyes with the centre line on the front of the head and the continued line over its crown, lets me appreciate the proposed direction of the head. To work the head from one view point, the whole figure can be angled on the post allowing the centre line of the head to become vertical, making it easier to relate the symmetry. Adjusting the head in this way means you will have to be aware of the change in the grain's orientation as it is now obviously not vertical. We regularly have to negotiate end grain on a carved head but positioning the work at an angle disorientates your eyes and compounds the problem. Carving a bearded man can create a further problem because the facial hair distorts the natural proportions of the face and head. Take extra care therefore, when carving, not to unconsciously elongate the upper part of the face, assuming that the bottom of the beard and chin are one and the same. 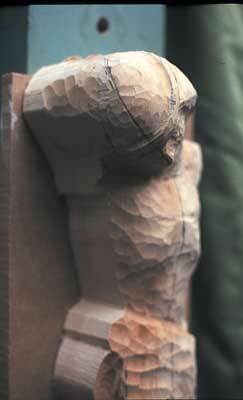 As with the body, you must never work the back of the head until the face has been successfully carved. This is a key procedure, and I have even seen so-called professional carvers teach and ignore this method, to the detriment of the student. 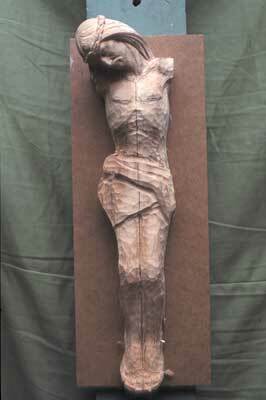 This crucifix was worked only from a photostat enlarged to the required size from a photograph taken from the original figure I had carved. As I had already carved the larger version, I took the decision not to make a maquette, so I didn't have a side profile to work from - this meant the positioning of knees from back to front had to be an educated guess. It was soon clear that while sketching in the figure by eye, I had made the legs too long. A helpful aid for the length of a figure's lower leg is to measure from the sole of the foot to the centre of the knee - this should be approximately one third the distance from the sole of the foot to the middle of the clavicle (collar bone). This type of measurement helps particularly with a crucifix because the feet are often angled down, which causes an illusion by making the lower legs visually too long. Following the traditional procedures meant that I hadn't cut behind the legs, therefore I was able to push back the knees, thus shortening the legs and remedying the situation. Having found the legs, I then sketch in the feet, ensuring the heels touch the cross and the big toes are on the correct side of the feet - an easy error to make if the legs are crossed! Remember do not cut between the feet; this then allows you to move them a little. Another rule that helped me remedy the error is that you must never take away material between features, whatever they may be, until these features have been established from the front and the outside of the work. This enables you to manoeuvre and adjust the form. 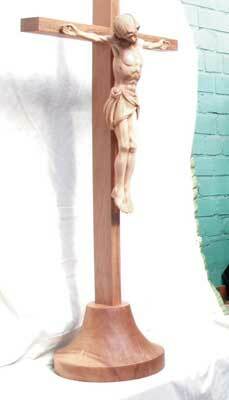 With the crucifix, because I hadn't cut between the legs or feet, this allowed me to push the legs back. Some eagle-eyed carvers may see that I had partially sketched in between the legs. This was initially just to help me get a quick visual and was done with the larger flutter (3711-13mm BN), so restricting deep cuts. All sketching in work should always be done with a larger chisel, restricting you from cutting too deep due to the chisels width; it also consequently stops you introducing detailed work too early. Research needs to be undertaken on the design of the loincloth and how it fits the body. As with this figure, it is often stylised but there must still be an element of reality in the creation, or they can sometimes take on the appearance of a baby's nappy. 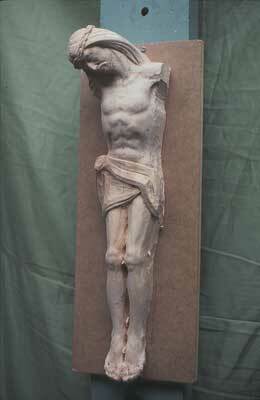 Obviously care must be taken to ensure Christ's posterior is against the cross, so determine the depth of the lower torso, position the front of the cloth, then superficial details can be carved. With the features of the main body found, our attention can be transferred to the hands and arms. You will have noticed that where I am adjusting the joint and angle of the arm, I have not taken away any material from behind the shoulders. Again, this allows me to re-adjust the position and angle of the arm, making certain the back of the hands touch the cross. 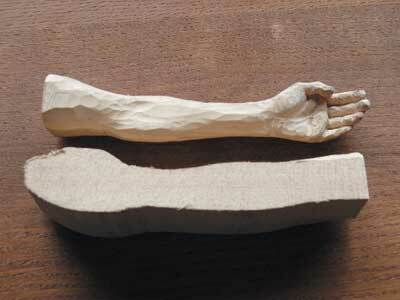 Ensure the arms are the same length by measuring the tips of the fingers to the centre line of the body. Often I am asked which is the easiest to accomplish, smaller or larger figures - they both have their own individual problems. 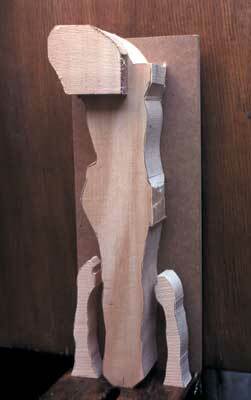 Smaller means less timber to purchase and little wood to extract but presents a smaller tolerance when finding the form. Obviously very small items require patience and expertise because the features are so small. I would advise you not to attempt a figure below 460mm (18in) to begin with. Larger figures mean greater cost in timber and more work in extracting the material but there is a benefit, as the tolerance is larger to adjust any errors. I feel it is easier with larger pieces as you gain confidence on broader surfaces. This allows you to be bolder and fearless in the way you use the tools. I can guarantee that with every figure I undertake, and there have been many, it is the procedures that have been passed down from generation to generation that I rely on and gives me the confidence to reach a satisfactory conclusion. I hope this little sortie into these procedures has helped you and please don't get discouraged if you make an error - just enjoy and carry on carving. "You must never work the back of the head until the face has been successfully carved"